Home News IDW Teams With Archie Comics To Celebrate 75 Years Of Archie! San Diego, CA (September 10, 2015) – Archie Comics, the acclaimed and bestselling comic book publisher that is home to some of the best-known pop culture creations in the world, including Archie, Jughead, Betty & Veronica, Josie & The Pussycats, Sabrina the Teenage Witch and the hit AFTERLIFE WITH ARCHIE and CHILLING ADVENTURES OF SABRINA horror series, is marking their 75th anniversary in 2016. And to help ring in this monumental occasion, IDW Publishing is celebrating their publishing partner in the form of Archie tribute covers throughout the month of December. 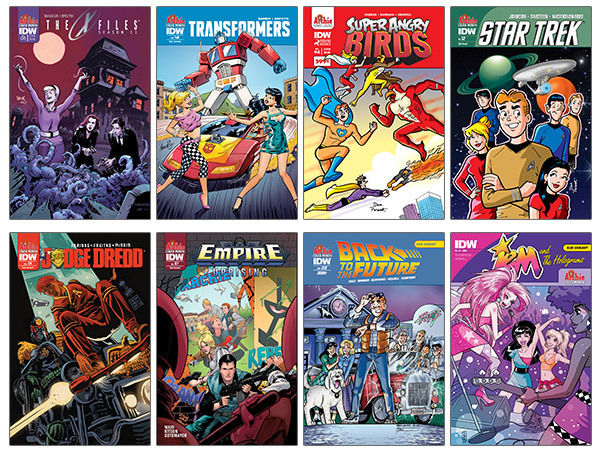 Eight different IDW titles will feature variant Archie tribute covers, many of which are illustrated by fan-favorite Archie artists. archie 75, archie comics, idw publishing, press release. Bookmark.